An eccentric woman with moralistic values befriends a man who has found himself on the wrong side of the law on numerous occasions. 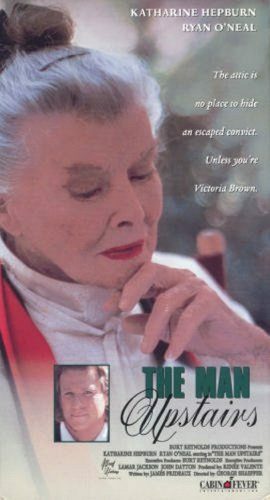 Throw in some witty dialogue and a mix of charismatic characters, and you’ve got The Man Upstairs, a 1992 television movie starring Ryan O’Neal and Katharine Hepburn. This film starts out at a fast pace, hooking the audience within the first few seconds of screen time. The action slows down as the story progresses, but this does not take away from the suspense. Anyone watching the film is constantly wondering what is going to happen next. That element of intrigue is what makes The Man Upstairs so captivating. There are moments when one wonders what is going on between the two main characters. The story certainly has enough spark sprinkled in to give the impression a bit of a May-December romance could be on the verge of blossoming. To fully understand and appreciate this film, one must start at the beginning. Picture an average neighborhood in which all of the citizens know each other. Nothing ever happens in this quaint part of the world. This changes when Mooney Polasky, a convict, manages to escape prison and roams the area, trying to stay hidden from the cops and anyone else who might recognize him. Hiding out becomes even more of a challenge after a guard is shot. Mooney was with the man who shot the guard, and he is in as much trouble for helping another person commit a crime. There is only one place to find safety and security, and that is in the attic of Victoria Brown, an elderly woman who has lived in seclusion her entire life. As the daughter of a judge, she has a vast knowledge of how the law works. This does not mean she is always on friendly terms with the sheriff. She is polite to him, but stands her ground on something that happened years earlier. The sheriff’s brother was charged with petty larceny. Although the incident occurred a long time ago, neither of them is willing to forget about it. Not even his wife can get him to stop resenting Victoria for her father’s ruling. However, she does manage to convince her husband to go to her house and see that she is unharmed. With a criminal running free, nobody wants to take any chances. How Mooney manages to stay hidden as long as he does is quite amazing. It is only when he decides to sneak downstairs and rummage through the refrigerator that he is discovered. Upon seeing him for the first time, Victoria is frightened by his disheveled appearance. However, she takes pity on him, offering him more food. She even allows him to stay until the weather warms up. Keeping her secret guest from her housekeeper and other help is a challenge. As time goes on, those who are employed by Victoria begin to wonder why her appetite for large amounts of food has significantly increased. Also, there are little things (such as a razor and some clothing) that she must make up stories about in order to protect Mooney from being found out. She explains that the razor is to be given as a present, and says the clothes are for charity. No one questions her claims, believing she is telling the truth. The chemistry between Mooney and Victoria starts to crackle during a scene in which they are eating a steak dinner. He dresses up for the occasion, choosing to wear a suit she has provided for him (through the generosity of someone else). She comments on how nice he looks, and they enjoy an elegant meal with engaging conversation. The elaborate feast is only the beginning of the attention Victoria lavishes on Mooney. As she gets to really know him, she discovers that he has a soft side underneath his tough guy exterior. Victoria realizes Mooney’s roughness stems from the troubled childhood he had. After winning her trust, he confides to her that he never knew who his father was. Mooney also says his mother, who prostituted herself out to men, physically abused him. Victoria feels sorry for him. It is Christmastime, and she wants to give him the holiday he never had. She goes into town and buys a big tree for Mooney. Later, they decorate it. Mooney cannot get over how beautiful the tree looks. Victoria is more interested in seeing how happy he is. The tree isn’t the only gift she has for him. While she was out shopping, Victoria purchased a watch. She gives it to Mooney after the tree is decorated. He is overwhelmed with emotion and kisses her gently on the cheek. Taken aback, she says it is unnecessary. Still, it is clear she enjoyed being kissed by her much younger friend. Perhaps more startling than the kiss is the poem Mooney has written for her. He reads each word with confidence, and one can tell it was written from the heart. Victoria is genuinely moved by his endearing gesture. They spend the evening sipping champagne and talking in front of the fireplace. His days of confinement have not diminished his passion for stealing jewelry, however. At one point in their conversation, Mooney suggests they become partners. He tries to convince her she will be the perfect accomplice, but Victoria dismisses his suggestion by saying she is much too old to be embarking on a life involving theft. Suddenly, someone is spotted outside. Mooney panics, realizing it’s the cops. He accuses Victoria of betraying him. She insists she was not involved. (And she wasn’t. The cook and maid called the sheriff after finally coming to the conclusion there was someone living in the attic.) Mooney runs upstairs, and she answers the door, looking surprised to see the sheriff. He explains his reason for being there. Victoria informs him she was on her way to bed. All of a sudden, Mooney comes down the stairs, dressed in the dirty clothes he had on when he snuck into her house. The sheriff arrests him. As he is being handcuffed, Victoria tells Mooney she will see him soon. Before he went upstairs, she promised him she would get him out of jail so that they could be together. It is obvious how much this woman has grown to care for him. The movie ends with her watching him being put into the squad car. Even though this is a holiday film, it is one that can be seen any time of the year. The Man Upstairs has never been released on DVD, and it should be. Cable networks used to show it on occasion, but this has not happened in a long time. Such a rare treat is meant to be appreciated by everyone, as it is a story people of all ages can understand. Is there a theme to the movie? In my opinion, there is. Two people are depicted becoming friends and falling in love. The gap in their ages doesn’t matter. What is important is that they love one another. Anyone who watches this film will fall in love with Mooney and Victoria, just as these two fictional characters fell in love onscreen. Posted in Side Shots Film Blog and tagged Retrospective Reviews, TV. Bookmark the permalink. Trackbacks are closed, but you can post a comment.